What determines outpost influence loss? What exactly determines how much influence is lost on your outpost for lost defenses? I believe the other persons influence is heavily weighted in the calculation. They seriously need to update the math to give more, maybe any, weight to pit strenght and survivor level. 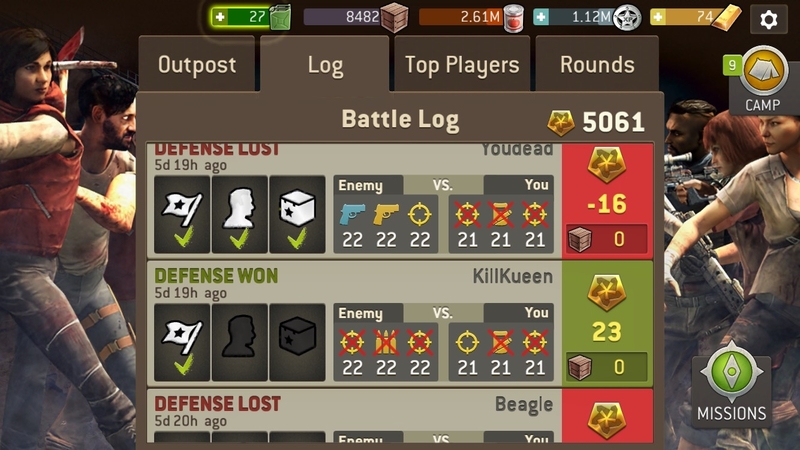 When i fight thru lvl 19 zombies, armored, and stunners, then kill level 18 defenders with my lvl 15 attackers, 10 lousy points is rather insulting. I built myself up over 5k and pretty much any time i loose i loose about 24 points even though my pit is weak and attckers are almost always 2 o 3 levels higher. Even @DLich will struggle with this one. @I_Am_Psycho a few players tried to figure this out a while back and we gave up on it. The only synapsis we can conclude is that if you lose alot of influence it means the person whom defeated you has lower influence than you do. If you lose 0 influence then the person whom defeated you has much more influence than you do. We couldn't determine what matches players other than camp level and influence of some range variation. There's too many variables (survivor levels, rarity, pink stars, camp level, influence, walker strength, etc) to try and figure the exact matches. I think there is some minimum wage guy in some dark corner of NG headquarters rolling a 20 sided dice. @Teeceezy please tell me I'm right! Complete speculation on my part, but I had it in my head that HOW you got beat matters. In other words, if the other guys takes less or no damage, you lose more influence. Just a guess with no real way to test the theory, though. So for your example, yeah, all three of their guys lived, but maybe they were all bruised/injured? Whereas if all received heavy injury, maybe you lose 0 influence. On the flip side, maybe your guild mates lost 16 because their defenders didn't even damage the raiding opposition.